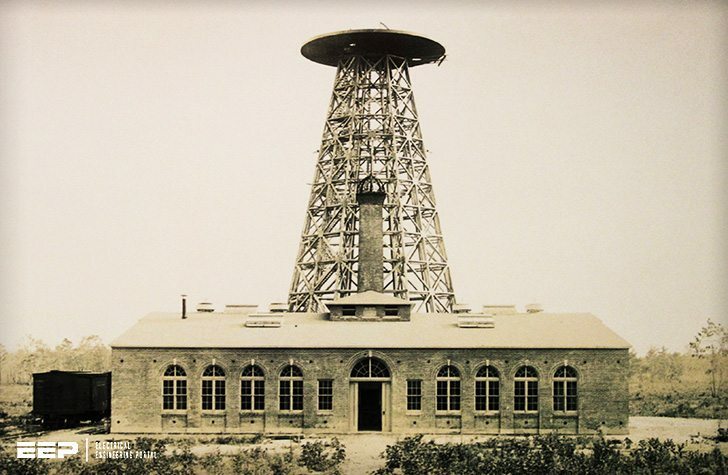 It can be seen from Tesla’s notes during the construction of the Wardenclyffe tower how Tesla’s ideas on wireless energy transmission formed and developed. In the patent submission („The apparature for electrical energy transfer“, 1902/1914.) the transmitter has one disadvantage and that entails the standing waves frequency in special coil and standing Earth frequency is the same. Namely, coils of common dimensions operate at resonance frequencies of several tens of kHz, in the frequency range in which weakening of standing waves on Earth is considerable. 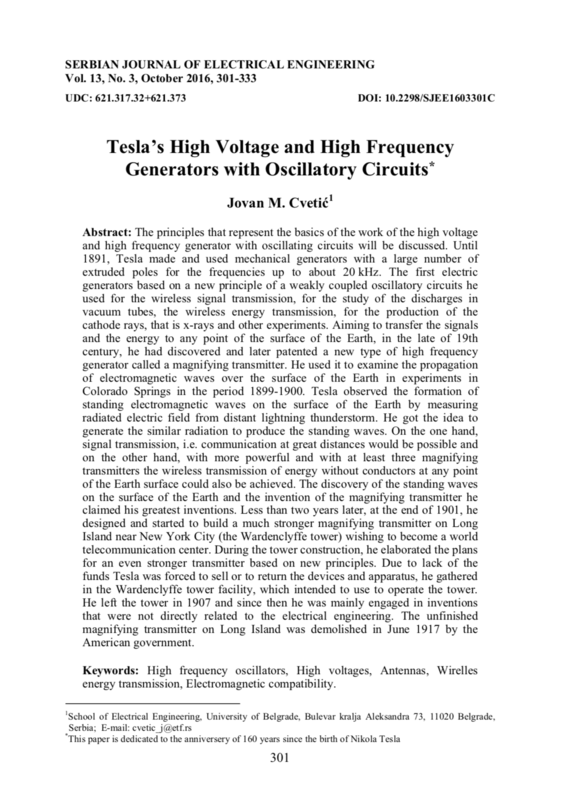 Tesla knew that wave weakening at low frequency propagation (up to a few kHz) is very small, but he could reach those frequencies only by using large dimension coils. 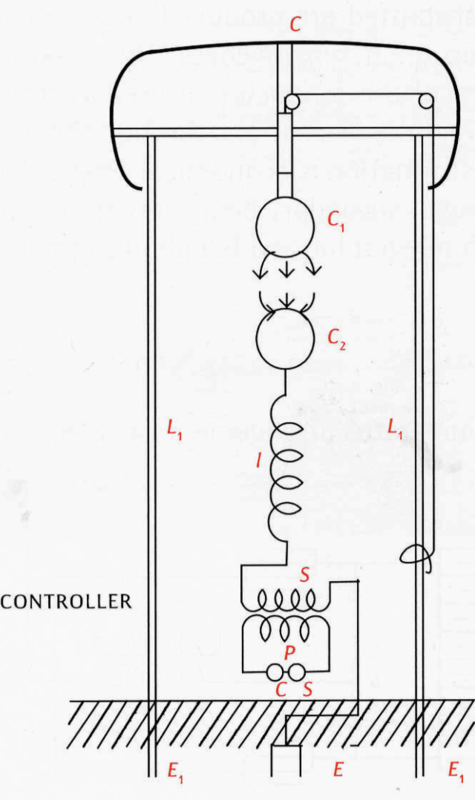 This is why he devised the magnifying transmitter with independent excitation in which the high-frequency magnifying transmitter with special coil is a source for an independent oscillator emitting low frequency waves, Figure 1. At the same time, this solution enabled also the precise determination of wavelength of the emitted waves, because the source and the transmitter had been separated, and it reached substantial increase of the emitted power. Figure 1 – The internal independent supply represents the high-frequency transformer with special coil (Source: Popovic Vojin, Nikola Tesla – From Colorado Springs to Long Island. Belgrade: The Nikola Tesla Museum, 2008, p.496). Tesla’s drawing from notes, 29th May 1901 in connection with new transmitter version in Wardenclyffe. He added the spark gap C1-C2 and the spark gap ball distance adjustment wire. On 29th May 1901, for the first and the only (noticed) time, he mentioned the new transmitter version in Wardenclyffe. He analyzed certain inductivity and capacitance in the circuit, but unfortunately did not explain the principle of its operation. Most likely, this was obvious to him as he was an experienced experiment performer, so he skipped an explanation. It can be seen that the high-frequency transformer with special coil was utilized as a generator supplying the capacitance dome C by means of the large spark gap C1-C2 thereby constituting the external closed circuit with the tower body and the ground (the tower body has the inductivity L1, which means that it is conductive). The external independent circuit frequency can be now put in resonance with the necessary wave frequency across the Earth’s surface by changing conductive elements in the tower construction. It should be noted that the structure of this tower is conductive in contrast to the original Wardenclyffe tower that was made of wood. In addition to supplying the dome, the internal high-frequency transformer with special coil does not influence the external.